Why are Monster Cookies named, well, Monster Cookies? Why are they not named Elf Cookies, or better yet, Unicorn Cookies? Why the "Monster" in "Monster Cookie"? A. Monsters do not like these cookies. 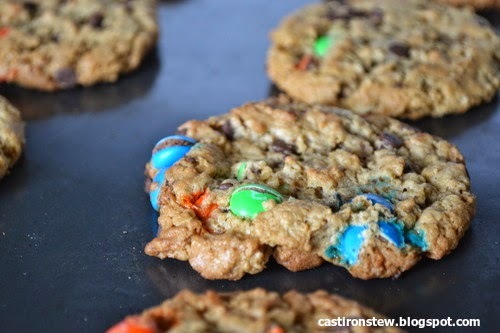 B. Monsters are attracted to these cookies. A. These cookies were once used to ward off unwanted monsters. B. These cookies were once used to attract the monsters away from under the bed, in the closet, etc. C. The ingredients in the cookies were from the Forest of Closet Monsters. Cream the margarine, peanut butter and sugars. Add the eggs, vanilla, baking soda, and salt. Pour in the oatmeal as the mixer is running. 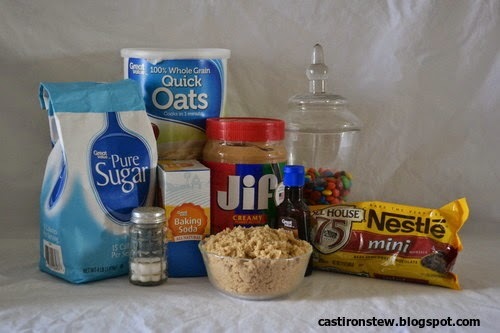 Add the chocolate chips and the M and M's. Do not over mix, or else your M and M's will break. If needed, hand mix with a wooden spoon. Bake the cookies at 350 F. for about 12 minutes. Try to let them cool before devouring them. Note: This recipe makes about four dozen cookies. This may seem like a lot of cookies, but whether you use them to ward off monsters (see Hypothesis A) or lure them closer (see Hypothesis B), you will probably need a whole bunch of them! I could have used these when I was little. I would have tossed them in the closet and closed the door. Now, I would just eat them.